There’s a big difference between someone signing up for a service, and someone using it on a regular basis. On this much everyone should be able to agree. But both of those types of people could be described as “users,” and companies often take advantage of the fuzzy wording to go with the bigger number. In the mobile messaging space, for example, Kik Interactive said last week it now has 100 million users. Line last month said it had 300 million. In both cases, the companies declined to say how many were active users — I know because I asked them, and declined to write up the stories when they said no. But others in the media took them at their word, and compared their size to companies that give out the more responsible number: People who actively use a service at least once per month. The chest-beating of the past few weeks by its mobile messaging competitors seems to have frazzled the folks at WhatsApp, the mobile messaging app that is most widely used in the most countries around the world. So WhatsApp called up yesterday to say it now has 400 million users — active users. WhatsApp is growing quickly; that’s up from 350 million in October and 300 million in August. We’ve seen this pattern before with other giants like Facebook. At some point they’ll stop boasting about the 50 million marks, then they’ll hit a slow spot and not want people to see their growth rate is down, then they’ll wait for a billion. Or something like that. WhatsApp also has a couple other stats it releases every so often that are mind-blowingly big. Its users now send 16 billion messages per day. (Some 32 billion messages are received per day, for a total of 48 billion messages handled, with some double counting.) Also, users now send 500 million images per day (more than Snapchat). 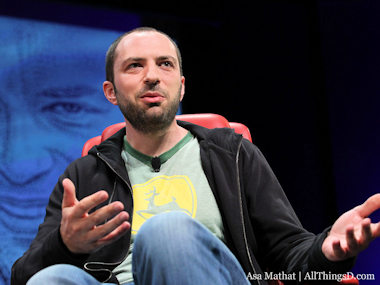 Mountain View, Calif.-based WhatsApp has just 50 employees. It has venture funding from Sequoia Capital and makes money from charging long-time users a dollar per year.